Travel theme: Graceful | Oh, the Places We See . . . The graceful arches of stately Southern trees form a suitable canopy over the road leading to Fort Clinch State Park on Fernandina Beach, Florida. The icing, so to speak, on all this Southern graciousness are the touches of green along the branches and wisps of Spanish moss that move delicately with the wind. For more entries in Ailsa’s Where’s My Backpack? photo challenge — Travel theme: Graceful — click here. This entry was posted in Coasting, Travel Theme and tagged Fernandina Beach, Florida, Spanish moss, Travel theme: Graceful. Bookmark the permalink. Thanks! Sort of reminds me of a Joyce Kilmer poem! 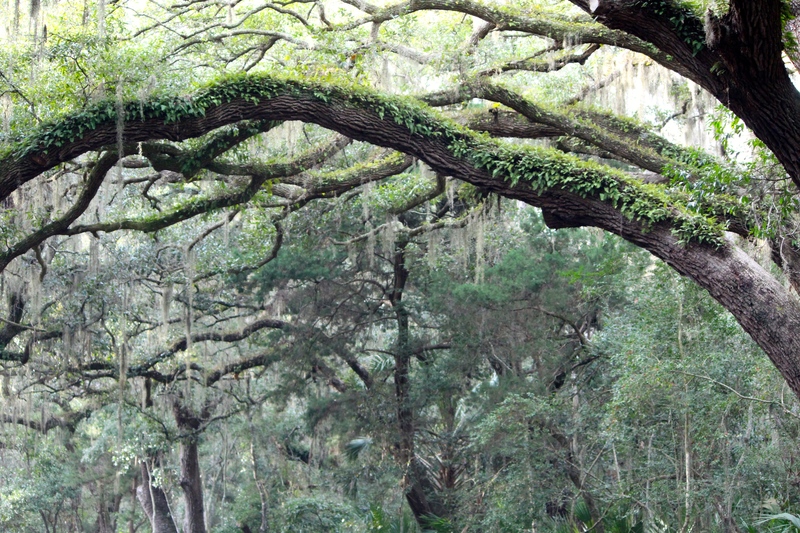 We loved the trees on this trip — old, Southern, dripping with moss. Graceful, indeed! Love this one, Rusha! Thanks so much, Amy. I love trees, especially old ones! Thanks so much, Amy. I just took a look at your photos with orange in them — fabulous! Love that butterfly especially! Thanks for the compliment! Not sure I was even aiming at an effect. We were just driving, and I asked my husband to stop so I could take a picture. Glad it turned out better than expected! Love your interpretation of this travel theme! 🙂 The trees are amazing – one of the things I miss most when I’m not in the south. I agree about the South and these old trees. Nothing like ’em! Thanks for commenting. Thanks so much. I loved that drive and actually I think I took the picture in a moving car!!! Here’s hoping spring moves gracefully into your area soon!